I followed up reading the D&D main three books by looking through the starter set I've had sitting on my shelf for awhile. It's a really well done adventure to kick things off and looks like it has enough content for a good 4-6 gaming sessions. 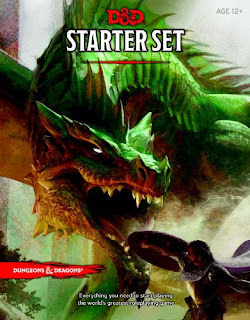 There are plenty of hooks and fleshed out encounters in the starter set. I can see why it's such a good place to start. It's hard to know how good it is overall without actually running it with a group, but it's definitely something I'll hold onto and pull from some day. The thing that surprised me the most was actually how many combat encounters there were. I feel like most of the D&D that I watch or listen to online is at it's best when players and NPCs are interacting to move the story forward. Not necessarily when they're in combat. I think if I were to run this for a group I would dial back the combat encounters by at least 50%, but that's all personal preference. I know there are groups out there that live for the combat. All of these D&D source materials have actually given me a much better idea of the type of game I would love to run. Now I can let it percolate in the back of my head for awhile until I get the right group to play with.